Located on the Windward side of Oahu, a 45-minute drive from Waikiki, get away from the hectic urban environment and repose with nature, surveying the magnificent scenery that this island paradise has to offer. Take a deep breath and enjoy life as you navigate through picturesque valleys and cross-seasonal streams. Follow the trails as you pass by WW II bunkers and enjoy the wide open spaces as you tool across the landscape on your 4-wheel drive recreational vehicle. 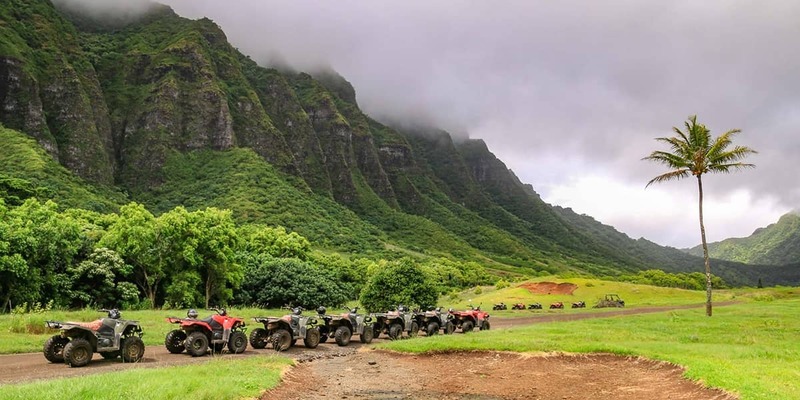 Experience the beautiful scenic Kualoa Ranch 1-hour ATV adventure ride in this pristine Hawaiian valley and cruise along the well-kept trails breathing in the healthy air. This ride takes you on tour to famous movie locations and scenic views of the Pacific Ocean. One hour tour time includes safety briefing. Please check-in for your tour at least 15 minutes before your tour time. 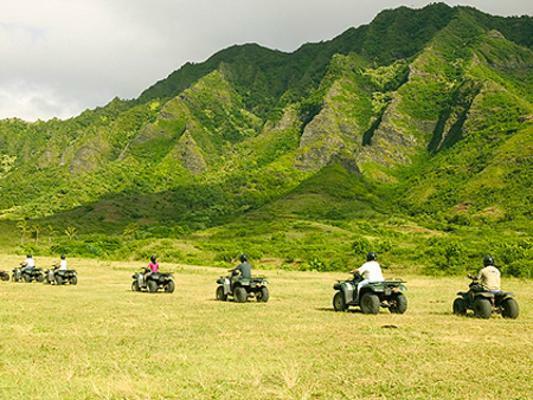 The 2-hour ATV ride is for our more experience or adventures riders to see more of the Beauty of Kaaawa Valley. The path can be quite muddy, dusty, and rugged. Visitors should wear durable clothes that they aren’t concerned about getting dirty. It is wise to wear long pants, a hat, sunglasses, sunscreen, and a towel. This ride takes you on a tour of famous movie locations, scenic views of the Pacific Ocean and deep into Kualoa’s secret spots. Two hour tour time includes safety briefing. Please check-in for your tour at least 15 minutes before your tour time. 9:30am | 11:15am | 1:45pm | 3:30pm – Please select a time during the booking procedure. Ride at your own risk. ATVs are potentially dangerous, and all riders must acknowledge this and sign a liability release. Riders are cautioned to follow instructions from the tour leader about safe speeds and staying on the trails. ATV riders must be 16 years or older. Trial run dividing novices from the experienced drivers determining which they ride with. These rugged all-terrain 4wd ATV vehicles don’t have any power steering, so drivers must have some strength and coordination. The Kualoa Ranch is 4000 acres of private property. 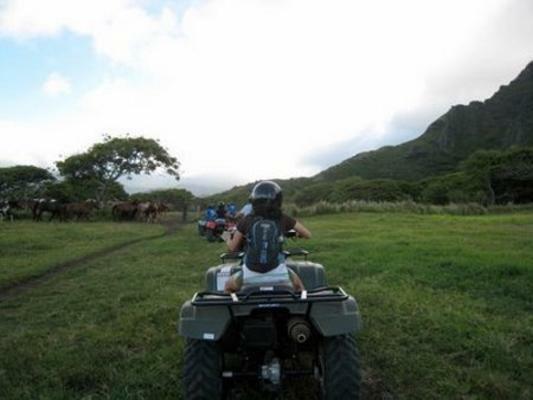 Tourists must receive a special permit or go on one of the tours to enjoy the Kualoa Ranch and the Kaaawa Valley. All tours start at the Kualoa Visitor Center. 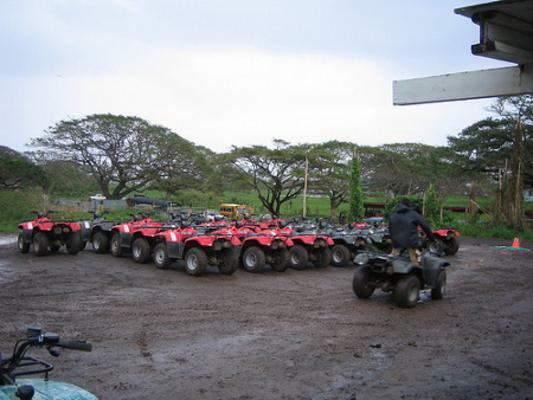 The Kualoa Ranch 1-hour ATV ride tours usually are scheduled for the morning and afternoon. Plan on giving yourself plenty of time for preparation before actually going out on the trails. The Judd family has kept the property in its hands up until the present day. They have envisioned themselves as stewards of the land. They continue to run a fully-operational eco-friendly ranch with numerous animals (ostriches, horses, ducks) for the tourists to see. At the same time, they use the land for numerous recreational activities including water sports, horseback riding, and ATV riding. They seek to be eco-friendly in incorporating tourists into nature in unobtrusive ways.